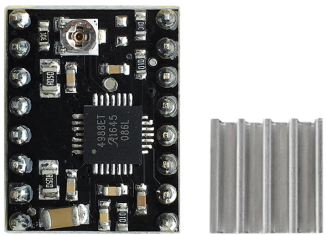 This stepper motor driver is powered by A4988, a DMOS microstep driver with converter and overcurrent protection. It is available in full, half, 1/4, 1/8 and 1/16 stepping modes to operate bipolar stepper motors with output drive performance up to 35 V and ± 2A. The A4988 includes a fixed turn-off time current regulator that operates in slow or mixed decay mode. 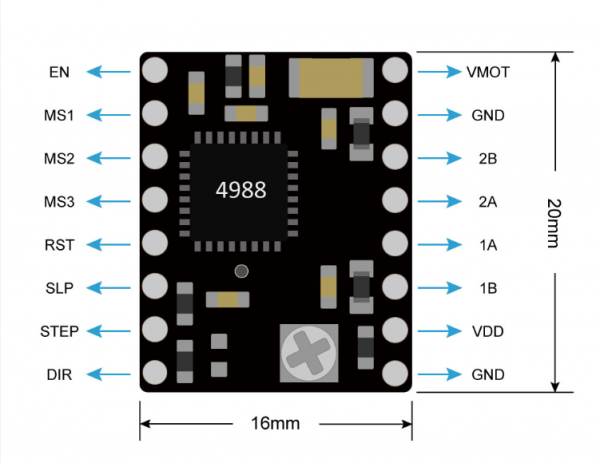 The converter is the key to easy implementation of the A4988. 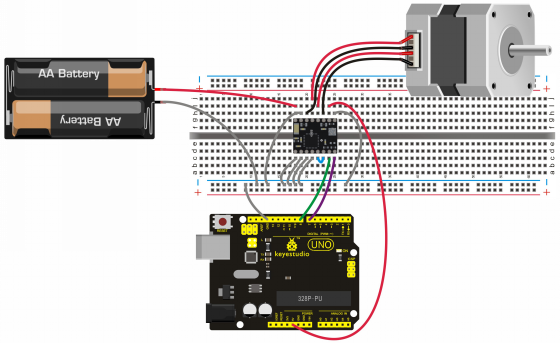 As long as the "step" input carries in a pulse, you can drive the motor to produce micro-step. There is no need for phase sequence tables, high frequency control lines or complex interface programming. 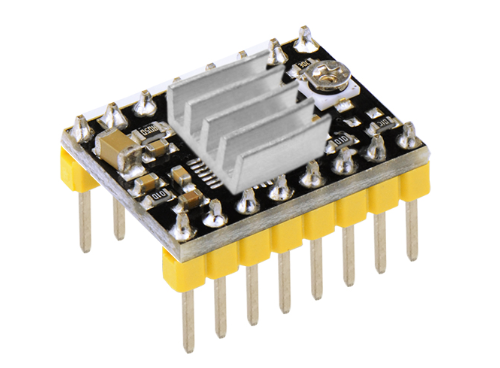 The A4988 interface is ideal for complex microprocessors that are not available or overloaded. 6.Ground short circuit protection and load short circuit protection. 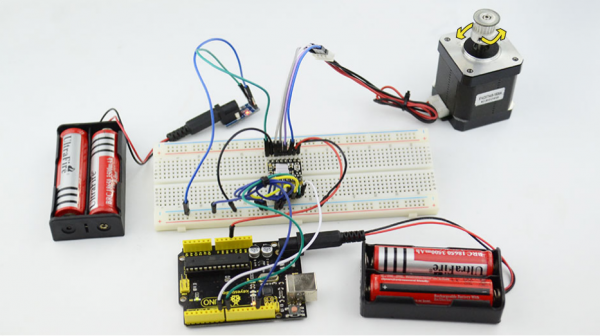 It needs to connect DC 8-15V between motor power VMOT and GND. 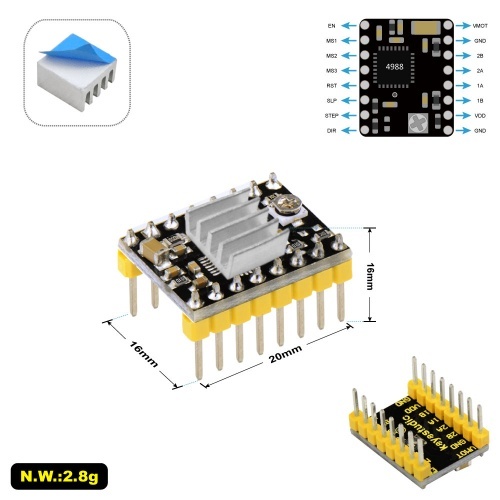 The selection end MS1, MS2, MS3 of three modes are all connected to GND, that is, full-step mode, and the motor needs 200 stepping values or a stepping 1.8° to turn a round. In the experiment, we first let the stepper motor reverse 8 circles and delay 0.5 seconds; then turn 40 circles and delay 0.5 seconds. If it is an half-step mode, then the number of both positive and reverse circle should be halved. This page was last edited on 24 April 2019, at 11:44.